459 E South Street is located in Bishop California, in the Downtown area. This home is three blocks from Main Street and is in a quiet neighborhood. This 3 bedroom 2 bathroom home with office/den is 1,753 square feet and sits on 0.28 acre lot. This is a larger lot than most you will find in the Downtown East side of Bishop. This home has tiled flooring throughout. The living room has two separate entries and large windows that show beautiful views of the open DWP land and Sierra Nevada Mountain Ranges. The kitchen offers granite countertops, stove, dishwasher and refrigerator. The interior of the home has a fresh new coat of paint throughout. This home sits on the rear of the lot and offers a wrap around driveway for easy in and out. Large mature trees surround the property to offer shade and beauty. The front and back yard are fully landscaped. The backyard offers an uncovered patio and a separate out building, great for a project or art room. A one car detached garage is located at the East side of the lot. This property is walking distance from the canal and offers lots of space for kids or pets. 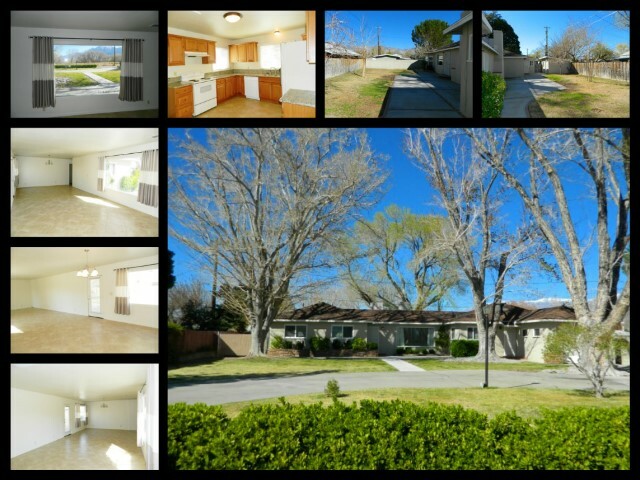 459 E South Street is in the area of Downtown Bishop that is a family friendly neighborhood. The home is conveniently located within walking distance to local shopping and restaurants located on Main Street, as well as the local schools.